At Jensen and Company, we recognize that buying your ideal home is just the start of enjoying the life of your dreams. The next, crucial step is putting your personal stamp and style on your residence, including your home office. 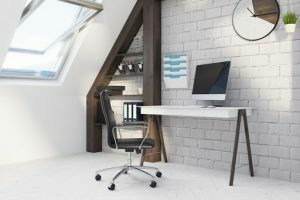 Here are some tips on creating an office that’s both efficient and uplifting. Proper lighting in your home office can stave off headaches, eye-strain and fatigue. It can also ward away the depression and irritability that comes from working in poor lighting. It all starts with harnessing the power of natural light. Choose an airy room for your home office, one with windows and even a skylight. We suggest you station your desk near your windows and parallel to the panes. 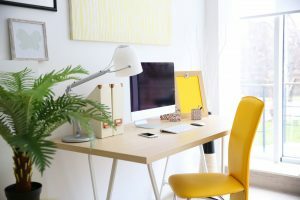 This placement will yield the many benefits of natural light, including better sleep, better absorption of vitamin C and greater productivity. You’ll be able to turn and look out the window when you need a break from your computer, enjoying the scenic vistas that first drew you to your home. Natural light is great for your mood, but you need additional illumination for when you work at night and when skies are gray. Table lamps or wall-mounted fixtures can augment ambient light and bring a warm glow to your office. There are a wide variety of attractive lamp and lighting designs. This is your chance to add style and a personal touch to your home office. The average person with an office job sits about seven hours a day. This sedentary lifestyle can wreak havoc on your body. Sitting too much puts you at a greater risk of developing heart disease and cancer, according to the Mayo Clinic. You may not be able to lighten your workload. You can, however, join the increasing number of health-conscious workers changing up their posture by using a standing desk. A standing desk can move smoothly from sitting to standing height. Getting the right chair is a form of self-care, one that will save you a bundle on chiropractic bills. You need an ergonomic chair that will support your body, especially your lower back. 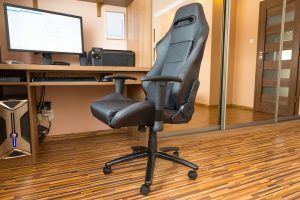 Some of the best office chairs in today’s market are adjustable, letting you move the armrests or lean back to stretch your back and ease your neck. If you are interested in living and working amid mountainous beauty, contact Brad Jensen. With decades of experience in high-end Park City real estate, he can help you find a place that suits your needs and feeds your soul.